Waitrose Cellar has teamed up with the Waitrose Cookery School to create this exclusive Spring Foodie Case of 6 fine wines delivered with 6 bespoke recipes. We are very excited to be able to share a selection of these amazing food and wine matches along with expertly crafted recipes over the next few weeks. 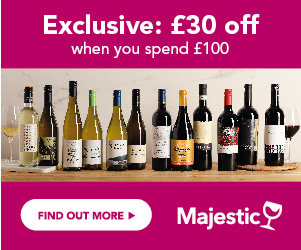 You can buy The Spring Foodie Case for £83.94 at Waitrose Cellar. The case comes with a leaflet containing all the matching recipes. 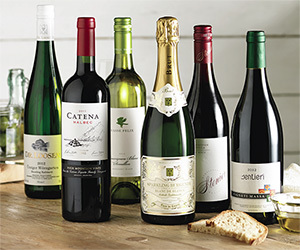 Visit the new Waitrose Cellar website, order any 6 bottles with free delivery. Mix together all of the ingredients for the tartare sauce and place in the fridge until you’re ready to serve. For the chips, start by pre-heating a deep fat fryer to 140°C and line a baking tray with clean, dry kitchen paper. Rinse chips under cold water, pat dry, then add to the oil and cook for about 7-8 minutes until soft and golden brown. Remove from the oil and drain on the paper. The chips will now be ‘blanched’ – so they will be fluffy inside and crisp on the outside. For the fish, increase the temperature of the fryer to 190°C and mix all the ingredients for the batter together until it’s smooth with the consistency of double cream. Season the flour with salt and pepper and use to dust the fish, then dip them in the batter. Fry two pieces of fish at a time for 7-8 minutes, until crisp and deep golden brown. Remove and drain on the kitchen paper. Keep them warm while you finish off the chips. Add the blanched chips to the hot oil and cook for 4-5 minutes or until crisp and golden brown. Drain on kitchen paper, season with salt and serve immediately with the fish and tartare sauce. This high-quality sparkling Burgundy is made the same way as Champagne using 100% Chardonnay grapes. It's full of creamy, fresh and zesty bubbles. 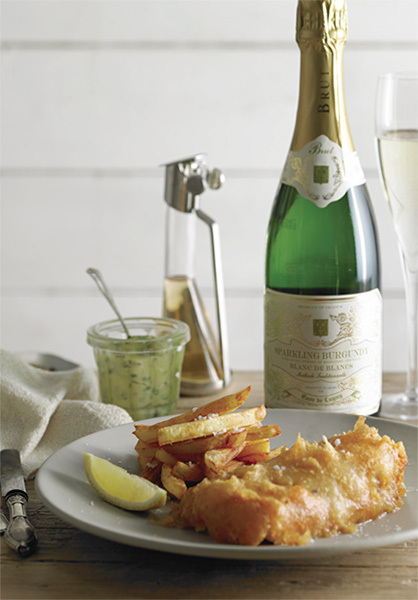 Sparkling wine with fish & chips is always a winner. The toasty notes, citrus and green apple flavours of the wine complement the nutty batter and delicate fish perfectly. Moreover, the high levels of acidity and bubbles cut through the deep-fried batter. A must-try!